By downloading and using the ziftrCOIN brand assets, you agree to the legal terms and conditions listed at the bottom of this page. We love that you want to create content around ziftrCOIN. We just want to make sure you're using our assets correctly. Here's a quick overview that should help you out. ziftrCOIN is one word. Lowercase "ziftr" + uppercase "COIN" = ziftrCOIN. The only time you'll capitalize any part of the "ziftr" is when you're capitalizing the whole name. Primary usage of our name. In headings that use all capitalization. You're more than welcome to use our logo. Our only request is that you don't make any changes to it. We like it just the way it is. We recommend using our color palette for any content you create. The teal and orange go together nicely, don't you think? ziftrCOIN is owned and operated by ziftrCOIN, LLC, a subsidiary of Ziftr, LLC and myVBO, LLC. All rights reserved. The name ziftrCOIN and the logos associated with this name are trademarks of Ziftr, LLC. These are important intellectual property assets and as such, proper use of these trademarks by third parties is critical to the integrity of our brand. We ask that you please adhere to the following guidelines when using our trademarks. Here is a general overview of Ziftr marks. Any instance of the word “trademarks” on this page is a direct reference to these, in addition to any other mark intended to direct traffic from the Ziftr and/or ziftrCOIN websites. You have permission to use our trademarks if and only if you follow the guidelines outlined in this section and if and only if you are not using Ziftr trademarks as described in the “Restricted Usage of Trademarks”* section below. Disclaimer: Portions of the materials used on this page are trademarks or registered trademarks of Ziftr, LLC. This page is not official and not endorsed by Ziftr™ or ziftrCOIN™. You must include the appropriate trademark symbol (® or ™) near any of our trademarks. You must not alter or distort the appearance of our logo(s) in any way. This includes, but is not limited to, changing the font, color or any of the design elements. You must not place your company name, trademarks, service marks or product names immediately next to or combined with our trademarks. You must not imitate our trademarks or name your company, product or service a similar name (e.g. ziftrGIVEAWAY, ziftrCOINS). You must not attempt to register any of our trademarks. You must not register a domain name that uses all or part of our trademarks in a manner that would imply our sponsorship, affiliation or endorsement. You may not use our trademarks on for-sale goods or services. You may not use our trademarks in a manner that implies our sponsorship, affiliation or endorsement. You may not use our trademarks in a disparaging or degrading way. If requested, you must provide us with samples of your marketing materials that contain any of our trademarks. If you come across usage of our trademarks that violate any of these guidelines, please contact us at info@ziftrCOIN.com and let us know. Get all the ziftrCOIN assets in one convenient .zip file. Copyright 2019 ziftrCOIN owned and operated by ziftrCOIN, LLC. All rights reserved. Ziftr®, ziftrCOIN™, ziftrWALLET®, ziftrSHOP®, ziftrPAY®, ziftrCART®, ziftrVERSE™ and the ziftrCOIN currency symbol are trademarks of Ziftr, LLC. Password reset instructions have been sent to you. Please check your email. Refer a friend and earn bonus ziftrCOINs! Share the URL below with your friends. For each new buyer who makes a purchase after clicking your URL, you'll be rewarded with 5% of the total purchase amount in ziftrCOINs. 1) WHO CAN PARTICIPATE? You must be a ziftrCOIN account holder who has already made a ziftrCOIN purchase to participate. 3) YOU ARE RESPONSIBLE FOR YOUR COMMUNICATIONS / YOU MAY NOT USE ZIFTRCOIN TRADEMARKS WITHOUT ZIFTRCOIN’S PERMISSION. You are limited in the way you may talk/write about the Program. You understand that for any communications you send you are sending them on your own behalf. You are not acting as an agent of ziftrCOIN nor will you be deemed an employee of ziftrCOIN. As such, while you can and should include your personal link in communications about the Program, you must not, without ziftrCOIN’s written permission, include any ziftrCOIN trademarks or other ziftrCOIN materials in your communications about this Program and you must not use any domain names or e-mail addresses that include ziftrCOIN, its marks or its web site URLs. The content of all of your communications about this Program must be yours alone. Do not misrepresent or embellish your relationship with ziftrCOIN or write, say or post anything you know is untrue or may be misleading. Do not make performance, price or other claims about ziftrCOIN. And, if someone has asked you to stop sending them messages about ziftrCOIN, respect that wish. 4) WHAT IS A QUALIFIED REFERRAL? Subject to the sole discretion of ziftrCOIN, you may earn 5% bonus ziftrCOINs for the total number of ziftCOINs purchased during each qualified referral. A “qualified referral” is defined as a verified ziftrCOIN purchase made by another person (not you or your agent) online at www.ziftrCOIN.com/presale who arrived at www.ziftrCOIN.com/presale via your unique referral link and who is a first time purchaser of ziftrCOINs. Once that person has made a purchase via your unique referral link, each subsequent purchase made by that person will earn you 5% bonus ziftrCOINs for the total number of ziftrCOINs purchased during each transaction. 5) LAST CLICK ATTRIBUTION. You understand that a qualified referral is only valid when your unique referral link is the last unique referral link clicked by the person (not you or your agent) purchasing the coins on the machine and web browser that they use to purchase them. 6) NO FRAUDULENT ACTIVITY OR ABUSE OF SYSTEM. ziftrCOIN reserves the right to void referrals and bonus ziftrCOINs earned if it suspects that the referrals or ziftrCOINs were earned in a fraudulent manner, in a manner that violates these terms or in a manner otherwise not intended by ziftrCOIN. 7) NO SIDE PROMOTIONS. STICK WITH THE REFERRALS. You must not conduct your own promotion in connection with the Program, bonus ziftrCOINs or referrals. Any communications you make available about the Program must be limited to referring people to the Program. 8) COMPLY WITH THIRD PARTY REQUIREMENTS. You agree that you will not post your unique referral link or otherwise promote the Program on a web site or other outlet that prohibits that activity. 10) WE WILL TRACK ALL E-MAILS, PURCHASES AND REFERRALS. You understand that ziftrCOIN will track all emails, purchases and referrals in a database. 11) WE WILL SEND YOU E-MAILS ABOUT THE PROGRAM. You may receive e-mails about this Program, including an e-mail each time one of your friends makes a purchase through your referral link and when that transaction is confirmed by ziftrCOIN. 12) VOID WHERE PROHIBITED/CANCELATION/MODIFICATION. The Program is void where prohibited and ziftrCOIN may cancel or modify these terms or the Program at any time. 13) YOU RELEASE US FROM LIABILITY. By participating in the Program, you agree that ziftrCOIN will have no liability and that you will indemnify and hold ziftrCOIN harmless for any claim, action, liability, loss, injury or damage to you or any other person or entity due in whole or in part, directly or indirectly, by reason of your participation in the Program. You will not settle any claim without the prior written consent of ziftrCOIN. Further, you agree that ziftrCOIN is not responsible for faulty referral links, any error, omission, interruption, defect or delay in transmission, order processing, or communication; technical or mechanical malfunctions; errors in these terms, in any Program-related materials; human-processing error; failures of electronic equipment, computer hardware or software; damage to your equipment, computer hardware or software, or inaccurate information, whether caused by equipment, programming, human error, or otherwise. UNDER NO CIRCUMSTANCES WILL ZIFTRCOIN BE LIABLE TO YOU FOR ANY LOSS OR DAMAGES OF ANY KIND (INCLUDING, WITHOUT LIMITATION, FOR ANY DIRECT, INDIRECT, ECONOMIC, EXEMPLARY, SPECIAL, PUNITIVE, INCIDENTAL OR CONSEQUENTIAL LOSSES OR DAMAGES) THAT ARE DIRECTLY OR INDIRECTLY RELATED TO THE PROGRAM. SOME STATES DO NOT ALLOW THE EXCLUSION OR LIMITATION OF INCIDENTAL OR CONSEQUENTIAL DAMAGES, SO THE ABOVE LIMITATION OR EXCLUSION MAY NOT APPLY TO YOU. ziftrWALLET is the first multicoin digital wallet to combine the control and security of a desktop wallet with the speed and convenience of a cloud wallet for all your coins. ziftrWALLET Mobile is currently available for Android and will also be available for iOS by the time rewards are received. An organic cotton ziftrCOIN t-shirt in sizes S-XL and a ziftrCOIN hat with an adjustable backstrap. A limited edition cold storage coin only available during the Presale - and a keychain to go with it. We’ll hook you up with a brand new mining rig all set up and ready to mine ziftrCOINs. The rig comes with 6 graphic cards and Red Harbinger’s Dopamine mining case, the world's first actual computer case designed specifically with mining in mind. This is your opportunity to meet the Ziftr team and have a say in the future of Ziftr and ziftrCOIN. Oh, and play lots of foosball in our fun office, of course. » Two-way airfare in the U.S. It's one unified process that allows users to shop securely and check out using both credit cards and cryptocurrency. As part of our launch, we’re giving away 300 million ziftrCOINs to the first 8 million people who sign up and reserved 50 million ziftrCOINs to sell in a presale. We’re guaranteeing a minimum redemption value of $1 per coin for up to 5% of each transaction conducted within Ziftr’s merchant network when ziftrCOIN is valued at less than $1 on the open market. Please see below to learn how these coins will be distributed. At this point, you must be asking yourself, “what’s the catch?” A $1 guaranteed minimum redemption value sounds too good to be true, but it isn’t. Let us explain. How can we redeem each ziftrCOIN for a minimum value of $1? Each time a user conducts a transaction on Ziftr's website or within Ziftr's merchant network, a portion of the total amount goes to us for lead generation and advertising. In other words, our merchants give us a percentage of the transaction value as a reward for bringing them customers. However, when users conduct transactions with ziftrCOIN, we'll take less than the standard amount for ourselves so that we can give part of it to the user in return for their ziftrCOINs. The $1 minimum redemption value is guaranteed because we'll use part of our own compensation to ensure that the value is never less than $1 on our website or within our merchant network. Currently, we have a large merchant network that continues to grow every day - with more and more big brands beginning to accept ziftrCOIN, Bitcoin, Litecoin and other cryptocurrencies via adoption of our ziftrPAY API. 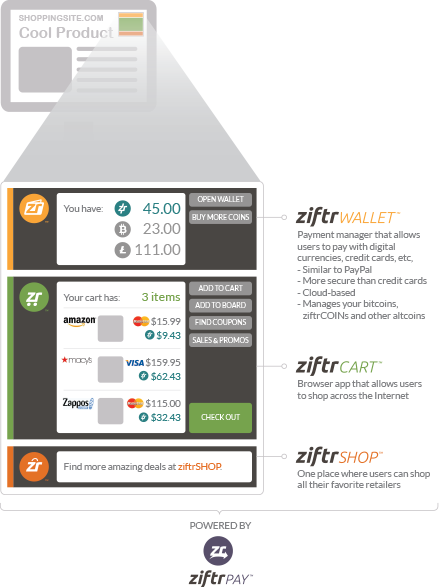 The diagram below shows how the process works traditionally and how it will work when customers use ziftrCOINs. In this example, a user is purchasing an item worth $100. How can you benefit from ziftrCOIN’s $1 minimum redemption value? When ziftrCOIN is valued below $1 on the open market, we will redeem each ziftrCOIN for $1 when used on our website or within our merchant network. When ziftrCOIN is valued at more than $1 on the open market, users will be able to spend as many ziftrCOINs as they wish for each purchase. The diagram below explains how this process will work at checkout. As you can see, it works just like a coupon. Of course, each ziftrCOIN can also be sold or traded on a cryptocurrency exchange at any time. The following chart outlines our intended usage of funds raised in the ziftrCOIN Presale. ZiftrCOIN, LLC reserves the right to change any and all allocations at its sole discretion. The example below shows usage of funds based on three different scenarios of presale amounts. All amounts are in US dollar equivalents.